Bukta's red change shirt was not unlike the previous Umbro version, last worn in 1961. It was the same v-neck, but the white numbers on the back were now in the Bukta style. The emblem on the left breast had a white border around it, but the accompanying shorts and socks were also red, more aesthetically pleasing than a combination of navy and red, when up against a team in all white. Although the white shirt acquired a round-neck version in 1963, the red had to stick with the less fashionable v-neck for the extensive tour of 1964, where it was twice worn against Portugal (then favouring white shirts), paired with white shorts and socks. Then, against Argentina (team group pictured left), the socks were all red, without the calf band. The shirts at the top of the page were worn (from the left) by Terry Paine (number-seven front and back) and Maurice Norman (against Czechoslovakia (including the F.A. 's Centenary emblem, in close-up to the right)). Simon Shakeshaft, curator of the Neville Evans National Football Shirt Collection (England Match Shirts section) supplied the images. Notes England wore the F.A. 's Centenary emblem, against Czechoslovakia. Notes England wore the red away shirt with the white away change shorts, but wore plain white socks, against Portugal. Notes England wore the red away shirt with the white away change shorts, but wore plain white socks, against USA. Notes England wore the red away shirt with the white away change shorts, with plain red socks, against Argentina. 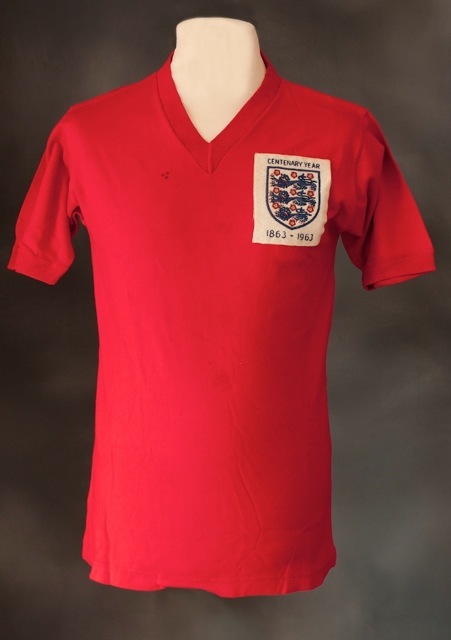 This shirt worn in one of the games against Portugal in 1964, kindly reproduced here from Richard Clarke's 'Three Lions - England Match Worn Shirts' Facebook Collection.